PLEASE NOTE: Leontia Flynn sadly will no longer be appearing at this event. However, she’ll be replaced by two new wonderful readers, detailed below. 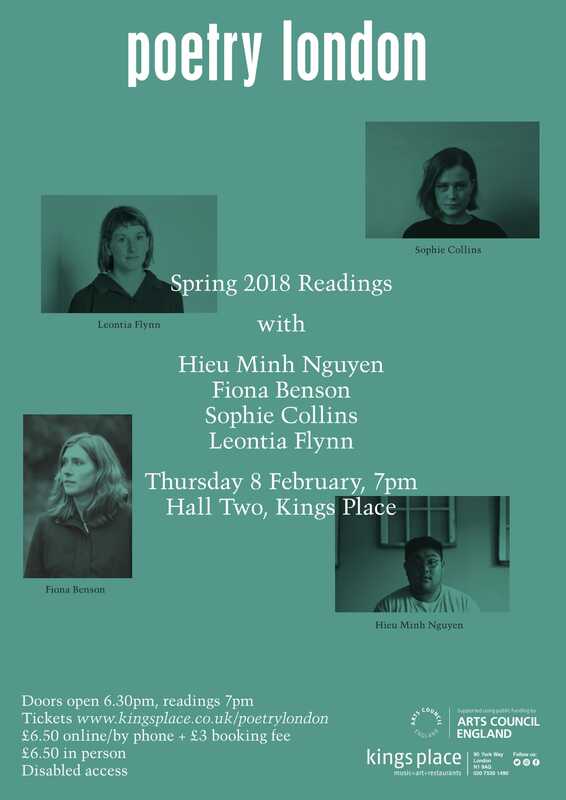 Poetry London launches its Spring 2018 issue with readings from Hieu Minh Nguyen, Fiona Benson, Sophie Collins and, newly announced Emma Jeremy and Mary Jean Chan. The evening will be introduced by current Guest Poetry Editor, Wayne Holloway-Smith. Hieu Minh Nguyen is a child of immigrants. Hieu is a Kundiman fellow, a 2017 National Endowment for the Arts Literature Fellow, a poetry editor for Muzzle Magazine and author of This Way to the Sugar. His work has also appeared or is forthcoming in Poetry Magazine, Guernica, Ninth Letter, Gulf Coast, Indiana Review, and elsewhere. His second collection of poetry, Not Here, is forthcoming on Coffee House Press in spring of 2018. He lives in Minneapolis. Sophie Collins is a poet, editor and translator. small white monkeys, a text on self-expression, self-help and shame, was published by Book Works in November 2017 as part of a commission with Glasgow Women’s Library. She is currently Assistant Professor of Poetry at Durham University. Fiona Benson lives in rural Devon with her husband James Meredith and their daughters, Isla and Rose. Her pamphlet was ‘Faber New Poets 1’ in the Faber New Poets series, and her full-length collection Bright Travellers received the Seamus Heaney Prize for first collection and the Geoffrey Faber Memorial Prize. Her second book Vertigo & Ghost will be published by Cape in 2019. Mary Jean Chan is a poet and editor from Hong Kong. Her debut pamphlet – A Hurry of English – is forthcoming in February 2018 from ignitionpress, with a selection of her work forthcoming from Carcanet’s New Poetries VII. As a co-editor of Oxford Poetry, Mary Jean is currently a PhD candidate and Visiting Lecturer in Poetry at Royal Holloway, University of London. Emma Jeremy grew up in Wiltshire and now lives in London. She was shortlisted for the Poetry School and Nine Arches Press Primers Scheme in 2017 and has previously been published in Rising, Poems in Which and Nutshell.